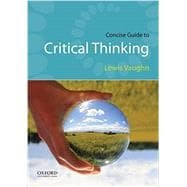 Lewis Vaughn's Concise Guide to Critical Thinking offers a compact, clear, and economical introduction to critical thinking and argumentative writing. Based on his best-selling text, The Power of Critical Thinking, Fifth Edition, this affordable volume is more manageable than larger textbooks yet more substantial than many of the smaller critical thinking handbooks. Lewis Vaughn is the author or coauthor of numerous books, including Living Philosophy, Second Edition (OUP, 2017), The Moral Life, Sixth Edition (2017), and Bioethics, Third Edition (OUP, 2016). Each chapter ends with Key Words, Exercises, a Self-Assessment Quiz, and Writing Assignments.